Christopher (left) and Richard Wilczewski train at Christopher and Brian Wilczewski’s gym ‘Movement Laboratory’ in Hainesport. All three family members have competed on American Ninja Warrior. For some people, life is about overcoming obstacles. For Brian and Chris Wilczewski, their teenage years were spent building them in the backyard of their family’s Mount Laurel home. When he saw what his sons were up to, Moorestown Township physics teacher Richard Wilczewski didn’t object. He decided if his sons were going to build parkour obstacles, he was going to help them do so safely. Nearly 10 years later, Brian, Chris and Wilczewski have gone from running obstacles in their backyard to competing on national television as part of the NBC show “American Ninja Warrior.” The show has brought the family closer together, uniting them around a common bond and inspiring Brian and Chris to start their own business as Chris competes for the eighth time on the season that is currently airing. Brian said the show first came on his radar when he watched the Japanese version on the gaming network channel G4. Feeling inspired, he decided to emulate the course and build obstacles in their backyard. Richard said he looked at his son’s materials and knew the course wasn’t going to hold, so he helped him design something more structurally sound. It wasn’t long before Chris got in on the action. He said he and his brother started building obstacles in the backyard and doing parkour in the woods. When the show came to the United States, both brothers were interested in competing, but the 21 year age minimum prevented Brian from trying out. So, Chris was the first of the two to submit his video to compete. He said, looking back, his submission video wasn’t very good but for whatever reason, he was picked to compete on the show’s second season. He said his parents were skeptical he was being scammed and insisted on flying out to Los Angeles with him. So, the whole family went to watch him compete. Chris broke the top 10 during the qualifier round and made it to the second round where he just missed the cutoff to advance. Despite not making it to the finals, Chris was hooked from that point forward. When he returned home, Chris and Brian began offering ninja classes in the backyard of the family’s home. They built the obstacles themselves and found old mattresses that neighbors were throwing out to use as padding. 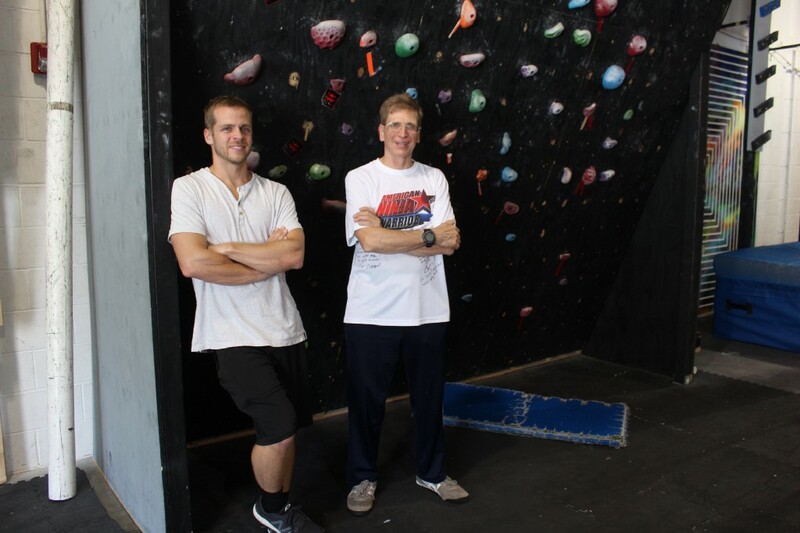 In 2011, the brothers decided to capitalize on their passion and open a ninja warrior training facility in Hainesport. They initially called the gym Ninja Laboratories, but fearful the ninja craze might die out, they changed the name to Movement Laboratories to encompass more different styles of fitness. Today, the brothers are co-owners of the Hainesport location and have two additional locations in California and Ohio as well. “We never really expected it to evolve to the level that it has,” Chris said. Eight years after discovering the show on G4, Brian turned 21 and got his chance to compete. He said the experience was a positive one, but he learned he suffers from a bit of stage fright. He said in his years competing, he sometimes gets out of the competition over a slight, panicked fumble. Richard received a callback to compete, and despite being eliminated early in the competition, he said to this day, he’s still training with the show in mind. He said Chris is his trainer, and at 63 years old, he’s in better shape now than he was five or 10 years ago. For all three, the best part of the competition has been forming meaningful connections with fellow ninjas from all across the country. To further foster the sense of community and provide more chances for ninjas to come together, Chris started the National Ninja League to give ninjas a chance to come together and compete outside of their one chance on the NBC show. Recently, Chris flew out to Las Vegas to compete on the season of the show that is currently airing. While he’s unable to say how far he made it, he felt just competing at all was a triumph after taking a year off from the competition. Looking back, all three agreed the sport has brought them closer together as a family. For Richard, the competition and business ventures have helped him to let go as a parent.